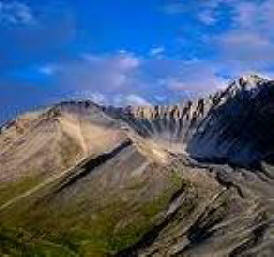 Mount Cleveland is a strato-volcano perched on Chuginadak Island, in Alaska. Most all of Alaska's volcanoes are located along the 1,500 mile Aleutian Arc that extends westward to Kamchatka and forms the northern part of the Pacific Ring of Fire. The beautifully symmetrical Mount Cleveland forms the western half of the uninhabited Chuginadak Island in the eastern Aleutians, connected to the eastern half of the island by a narrow isthmus. 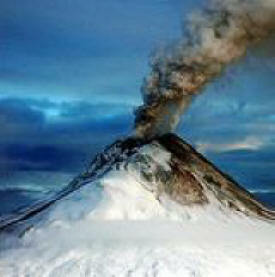 It is one of the regions most active volcanoes. 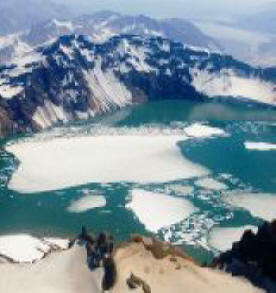 The 1730-m-high Mount Cleveland has the native name of Chuginadak, referring to the Aleut goddess of fire, who was thought to reside on the volcano. Numerous large lava flows descend the steep-sided flanks of the volcano. Cleveland is about 8.5 km in diameter and is joined to the rugged, though lower, eastern half of the island by a low, narrow strip of land. This strip is dotted with "lava flow, cinder, and ash patches, and conical hills. Although it is the tallest member of the Four Mountains group, Mt. Cleveland is reported to lose snow more rapidly than neighboring peaks presumably from anomalous heat generation. Hot springs were noted at the base of a volcano on Chuginadak Island in the 1800's. Like many other Aleutian volcanoes, the lower flanks of Mt. Cleveland up to about the 300 m elevation are more irregular and dissected than the upper flanks. The cones on the eastern half of Chuginadak Island are dissected by broad valleys presumably eroded in part by glaciers; in contrast, the upper cone of Mt. Cleveland is virtually undissected. 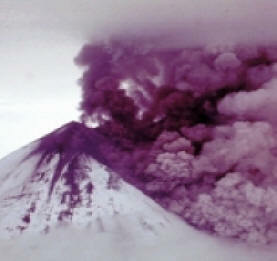 One of the most active volcanoes in the Aleutian Arc, Cleveland has erupted at least 21 times in the last 230 years. A VEI 3 eruption in 1944 produced the arc's only direct volcanic fatality. 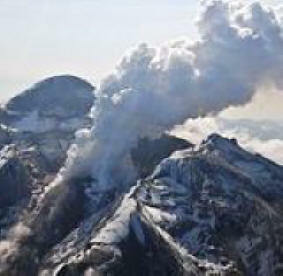 Most recently Mount Cleveland has erupted three times in 2009, twice in 2010, and once in 2011. The volcano's remoteness limits opportunities for its study, and the Alaska Volcano Observatory relies heavily on satellites for monitoring. The volcano is primarily hazardous to aircraft; many of the flights over the north Pacific approach the vicinity of the volcano, and volcanic ash released from eruptions can damage sensitive electronic equipment and sensors. Recent eruptions from Mount Cleveland have been characterized by short-lived explosive ash emissions, at times accompanied by lava fountaining and lava flows down the flanks. In February, 2001, Cleveland had 3 explosive events that produced ash clouds as high as 12 km (39,000 ft) above sea level. 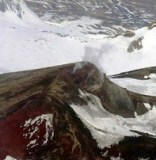 That eruption also produced a lava flow and hot avalanche that reached the sea. 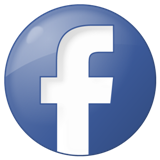 In September of 2011 Mount Cleveland began oozing lava, a signal that the mountain could explode and send up an ash cloud that could threaten aircraft. Satellite images show lava is building in the crater at the summit of 5,675-foot Cleveland Mountain. 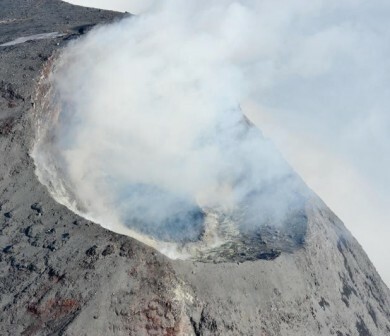 "It's forming a dome-shaped accumulation in the crater," said Chris Waythomas of the U.S. Geological Survey, the observatory's acting scientist in charge. "We call these things `lava domes.' It looks like a muffin top." Lava domes form a lid on a volcano's "plumbing," including the chamber holding the magma. When they grow big enough, lava domes become unstable and will sometimes collapse, decompressing the magma chamber and leading to an explosion, Waythomas said. "They can seal up the conduit and prevent gasses from escaping and lead to an explosive event,"
The nearest village, Nikolski, is on another island about 50 miles east and has 18 permanent residents. The village was not considered at risk in previous eruptions of the volcano. 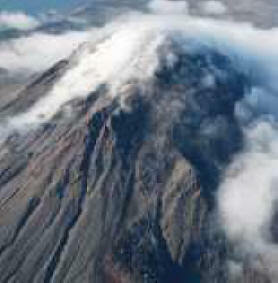 Cleveland Volcano's last major eruption was in 2001. It has had bursts of activity nearly every year since then.